There is a bit of a lack of stunt scooters on the market for younger children aged 5, 6 and 7. This may be for a few reasons. Firstly many kids this age are happy just scooting along. Secondly as kids this age are lighter and smaller the impact they make on the scooter with the jumps and tricks they do isn't as harsh as older, heavier kids and teens. Stunt scooters tend to be more expensive as they have reinforced and more durable parts to withstand the abuse from the stunts but materials have to be light as well. Therefore many parents may be reluctant to spend the extra on a stunt scooter that will last just a couple of years and will be used the majority of the time just for crusing. Having said this if you have a younger child that wants to do tricks and jumps on their scooter, it's important to find a scooter that will take some abuse. There are a couple of scooters on the market that will be suitable for 5, 6 and 7 year olds. There are some options below. ✔️ This scooter is the most popular one on this page with our readers. 1) You want to look for is a scooter with a handlebar which will come up about waist height or lower on a younger child. If he handlebar is too high the scooter may be difficult to control. 2.) The scooter needs to be as lightweight as possible. Stunt scooters need to be strong and durable so they tend to have heavier parts, but a stunt scooter which is too heavy will be too difficult for a youngster to do tricks on. 3.) The deck length should ideally be shorter than a standard deck so that it's easier for young kids to manage. 4.) If you're buying for a young child some (not all) scooter bars can be cut down after purchase so this is another option to consider. It's also worth checking out the guide to stunt scooters for kids to find out what all the specification and technical terms mean. 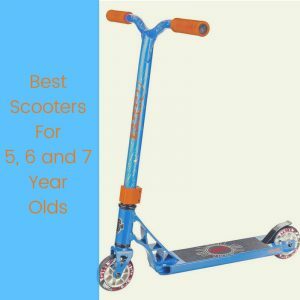 Find below 5 excellent stunt scooter choices for kids aged from 5 to 7 years. At the end there is a chart comparing the features and prices of all the scooters featured. This scooter is aimed at the 4 to 8 year old crowd so is an excellent choice from a leading scooter brand. The bars are 50cm height by 46cm wide (19.6" by 18"). The deck is also smaller than standard at 10.2cm wide by 43cm long (4" by 17"). The smaller bar and deck sizes make it much easier for younger kids to manage. The wheels have a metal core which means that it will withstand the impact of tricks and jumps (avoid plastic cores at all costs on a stunt scooter). The 110mm size means they soak up all the bumps while riding offering a smooth ride. It is lightweight at just 3.3kg. The Grit Extremist is a good entry level scooter which is worth considering for the younger rider. It is lightweight for a stunt scooter at 3.4kg which is lighter than other stunt scooters for younger users to control. 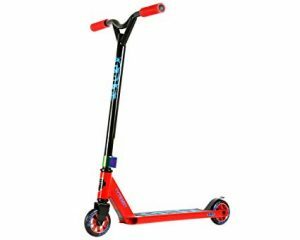 It has a smaller handlebar height than other stunt scooters (from the deck to the top it measures approximately 71cm which is a smaller size than standard. The wheels are good. It features 88A PU wheels with an alloy core. The Slamm Tantrum V​I scooter is designed for the younger rider with a lower handlebar. This makes it easier for younger kids to be able to control. The features include 100mm wheels with a nylon core, ABEC 7 bearings and the quad clamp for extra strength to withstand the impact from a younger rider's tricks. The handlebar height is 19.5 inches. The scooters are hand built by Slamm. A strong scooter which looks cool too. The maximum rider weight is 75kg. The Madd Gear MGP VX7 Mini Pro scooter is designed for younger kids and is smaller than a standard scooter but it still has high end specifications such as only normally seen on expensive high end models. So the strength and quality of scooter you get for the price you pay is really good. The deck is 2.5” shorter and the bars are proportioned for younger riders at 22” height x 18” width. Some good design features of the scooter include 100mm MGP 88a alloy core with high rebound PU & anodized cores which like the other scooters featured should be perfect to withstand the tricks of a younger child as well as cruising the streets. It's fairly lightweight for a stunt scooter at 3.55kg. This makes it a lot easier for younger kids to control and use for tricks. The bar measure 18" inches wide by 19.6 " high (46cm by 50cm). From the bottom to the floor it measure approx 70cm. The weight of the scooter is around 3.3kg. Brake is a super coil spring brake. This is a scooter designed by the same people who make the mini and maxi micro scooters.It's designed as an entry level scooter for kids aged 5 to 12 so that they can do basic tricks, jumps and stunts. It has a one piece aluminium deck and a triple clamp so is strong to withstand the impact of tricks. The PU wheels are 87A in durometer and have a metal core so are also strong to withstand the abuse from jumps. They have ABEC 7 bearings which is a very hight quality bearing. If you are on a budget this is an excellent starter stunt scooter.The handlebars measure approximately 68.5cm from the deck to the top which is a good size for a younger rider. Also, the deck is slightly shorter which makes it easier for 5, 6 and 7 year olds to control.